I live a blessed life. I’m not rich and all my dreams haven’t been fulfilled – I’m guessing the same is true for you. But being blessed isn’t a matter of how much money you have or what you’ve been able to experience or accomplish. Living a blessed life has to do with your relationship with Christ and living in that relationship. Jesus said that He came so that we might have life and have it more abundantly. He came so that we might have the promise of eternal life and the experience of a blessed life while still on this earth. I undoubtedly enjoy God’s many blessings. Still, I find myself in the group of people who fight the holiday blues. As I grow older, I find that the battle waged in my mind grows more difficult to overcome. Fortunately, as I’ve grown older, I’ve chosen to pursue God consistently, so hopefully my ability to win those battles has grown as well. I’m tempted to give examples of things that cause me to be bluesy. That would be falling into the enemy’s trap. It would be encouraging a bit of self-pity. You can all fill in the blanks if you like or just understand that I’m a lot like many of you – feeling down at a time of year when it seems that the world is feeling joyful. So it seemed a good blog would be the transparent one that shares how I’m dealing with my blues. Maybe they will help you fight the good fight. Don’t dwell on the reasons for your blues. It’s really tempting, but don’t do it. Pray, asking God to reveal Himself to you in a new way during this season. I’ve done that this year and God has been so faithful. Plan activities that don’t draw attention to the reasons for your blues. For example, the first year after Phil’s mom died, we had a very unconventional Christmas. I knew it would be a very hard time for him, so we didn’t do have a “normal” Christmas. We painted our living room over the holiday weekend, taking time out only to visit family for dinner. We had the opportunity to be a part of the celebration but kept ourselves busy at other times. Focus on praise. Yes, I know that’s hard work, but there is much to praise God for even when we’re feeling bluesy. Be more intentional about playing your favorite Christian music in the background (or foreground). Practice more giving – especially of yourself. Volunteer to serve meals at a shelter, visit nursing homes, organize food drives and gift-giving opportunities. You will be blessed. And you’ll sleep better each night when you’ve given of yourself during the day. Spend some time in prayer reviewing your year and asking God what your focus should be for 2014. Give a gift to Jesus. Again, spend some time in prayer – ask Jesus what He would like you to give Him this year. Cut yourself some slack. You don’t have to be busy all the time and you don’t have to be the perfect wife, mother, daughter, friend at a time when there’s too much to do. Don’t over commit, and if you do, graciously bow out. Smile and be friendly when you’re out and about. It’s so tempting to ignore everyone you pass by as you shop or run errands. Resist! You’ll be surprised at how better you feel when you make the effort to smile and be friendly to everyone you see – everyone! Enjoy your memories. If/when they start to swallow you, change the subject. But let yourself enjoy them in the meantime. Let go of unrealistic expectations. My mom lives in a nursing home. I miss “real Christmases.” I’ve learned to let go of the expectation that our Christmas gatherings will be enjoyable in the way that we used to enjoy Christmas. We’ll enjoy Christmas differently. I’ve come to learn that pretty much no one has the idea Christmas we all look forward to. Every family has their own difficulties. So let go of your unrealistic expectations and you’ll enjoy your Christmas season a whole lot more. Enjoy some special foods without feeling guilt! In fact, let go of guilt about everything over the holidays (and beyond). Stay close to the Holy Spirit and yield to conviction, but reject guilt. Ask for help if you find yourself battling the blues unsuccessfully. Don’t let them take root because they are hard to uproot. God is good, but we live in a fallen world. Don’t let the enemy of this world steal your joy for the next one! Enjoy your Christmas season. Expect God to be God! If you’ve been reading along with us using the Resting at the River’s Edge reading plans, for the past week or so you’ve read about Daniel and his friends Shadrach, Meschach and Abnego facing death a number of times. Have you noticed the results of those situations? I knew that in each case they were unharmed, but there’s more to the story. Let’s look closer. King Nebuchadnezzar had a terrifying dream. “He called in his magicians, enchanters, sorcerers, and astrologers, and he demanded that they tell him what he had dreamed.” (verse 2, NLT) Notice that the king didn’t tell them his dream and ask for an interpretation. He expected the one who would interpret the dream to first reveal that they new the dream without being told it. That would be his confirmation that their interpretation was from God. Then he went a step further: Any of these “wise men” (as he defined the term “wise” – as believers in the One True God, we would not apply the word “wise” to magicians, enchanters, sourcers and astrologers) any of these “wise men” who could not tell him the dream and its interpretation would be “torn limb from limb, and your houses will be turned into heaps of rubble!” (verse 5, NLT) That’s not good. That would include Daniel and his friends, even though they hadn’t been asked to interpret the king’s dream. When Daniel learned why he was going to be executed, he went to the king, requested more time to interpret the dream, and then gathered his friends to pray and seek the Lord. The Lord gave Daniel the dream and its interpretation. Daniel then told the king what he had dreamed and its interpretation. The result? The Lord saved not only Daniel’s life, but also the lives of the magicians, enchanters, sorcerers, and astrologers. But that’s not all. 46Then King Nebuchadnezzar threw himself down before Daniel and worshiped him, and he commanded his people to offer sacrifices and burn sweet incense before him. 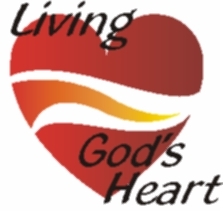 47The king said to Daniel, “Truly, your God is the greatest of gods, the LORD over kings, a revealer of mysteries, for you have been able to reveal this secret.” 48Then the king appointed Daniel to a high position and gave him many valuable gifts. He made Daniel ruler over the whole province of Babylon, as well as chief over all his wise men. 49At Daniel’s request, the king appointed Shadrach, Meshach, and Abednego to be in charge of all the affairs of the province of Babylon, while Daniel remained in the king’s court. Daniel was instantly snatched from the threat of execution to being appointed ruler over the whole province of Babylon and chief over all his wise men (that would be the magicians, enchanters, sorcerers, and astrologers who served false gods). In addition, Shadrach, Meshach, and Abednego were given positions of authority. King Nebuchadnezzar became taken with his own importance. He made a gold statue ninety feet tall and nine feet wide and required all people to bow to the ground and worship his statue. Anyone who refused would be thrown into a blazing furnace. The Lord not only saved the lives of the three amigos, He danced with them in the fire! And when the were taken from the fire, they weren’t singed and they didn’t smell of smoke! But that’s not all. 28Then Nebuchadnezzar said, “Praise to the God of Shadrach, Meshach, and Abednego! He sent his angel to rescue his servants who trusted in him. They defied the king’s command and were willing to die rather than serve or worship any god except their own God. 29Therefore, I make this decree: If any people, whatever their race or nation or language, speak a word against the God of Shadrach, Meshach, and Abednego, they will be torn limb from limb, and their houses will be turned into heaps of rubble. There is no other god who can rescue like this!” 30Then the king promoted Shadrach, Meshach, and Abednego to even higher positions in the province of Babylon. Shadrach, Meshach and Abednego were instantly snatched from certain death to being given even higher positions of authority in Babylon. Did you notice that were it not for the dire circumstances – that is facing certain death – God would not have been glorified and the servants would not have been promoted. Let me put it another way: the dire circumstances were the vehicle God used to bring glory to Himself and promotion to His servants. How do you view your dire (and not so dire) circumstances? Are they opportunities to give testimony to others that God is your source? Do you recognize them as opportunities for God to receive glory? Do you have the positive expectation that they are opportunities for God to promote you? My confession is that my faith is not as great as I would like it to be. I get stuck in my circumstances sometimes and forget that they are the vehicle God wants to use to promote me. I want to change my thinking – I want to expect God to be God! That’s what Daniel and his three amigos did! They expected God to be God in each circumstance, and the result was that He received glory and they were promoted. I want to face and experience the challenges in life as an opportunities for God to receive glory and for me to receive benefit. Living with that perspective isn’t living for personal or selfish gain, it’s expecting God to be God. Let’s do it! What challenge are you facing right now in which you need to expect God to be God? He wants to be God in your life. Trust Him. Give testimony to His faithfulness. And wait for Him to rescue. Then rejoice in the glory He receives and enjoy your promotion! Comments Off on Expect God to be God! From Discouragement to Faith – Make a Decision! I’ve run into several things over the past couple of months that seem to have the same theme. That typically means God is trying to teach me something. I read an article about never-ever-ever giving up, never-ever-ever quitting – even if you’ve been knocked down and it would seem all hope is lost. It was a powerfully written piece that stuck with me. It was an article about self defense, not our walk with the Lord. A short time later I was watching Olympics coverage of the men’s gymnastics team. They were falling apart. The announcer began to talk about a basketball coach he had interviewed. This basketball coach repeatedly said “I’m training them for the thunderbolt.” Yes, he would drill on layups and foul shots, but he saw his primary function as “training them for the thunderbolt.” That is – training them what to do when the worst happens. I think sometimes I am too easily discouraged. Maybe you are too. I think some times I give up too soon. Perhaps it’s because I’ve not trained for the thunderbolt. Perhaps it’s because I don’t have the proper systems and processes in place to move beyond discouragement into faith and confidence. When we face discouragement, there are (at least) five specific actions we can take to travel beyond that discouragement toward the faith that pleases God. We’ll look at those five actions in upcoming blogs. If we don’t make this critical first decision, we’ll never take the five specific actions that will move us toward faith and confidence. 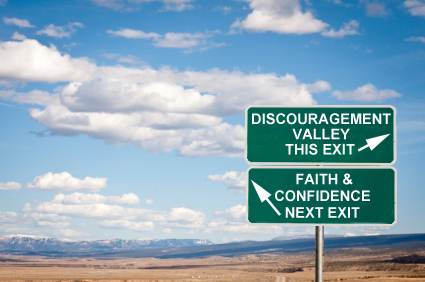 If we don’t recognize that our steering wheel is taking the exit ramp into discouragement valley (which is just a stop on the road to depression) and put a stake in the ground and say “No! Not on my watch! Not this time! That exit ramp is closed!” we won’t see the victory we’re promised. A few days after the walk-thru at the printer’s facility, I read a blog that encouraged…you guessed it…expecting victory. Check it out here. 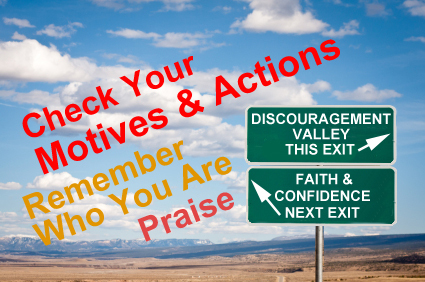 Then stay tuned for the five specific things you can do to move from discouragement to faith. Comments Off on From Discouragement to Faith – Make a Decision!